A free basic pattern for a simple scarf suitable for handspun or any bulky weight yarn. Make the scarf longer by using more yarn- 150 yards bulky yarn would be 60 inches long, 200 yards would be 80 inches long. 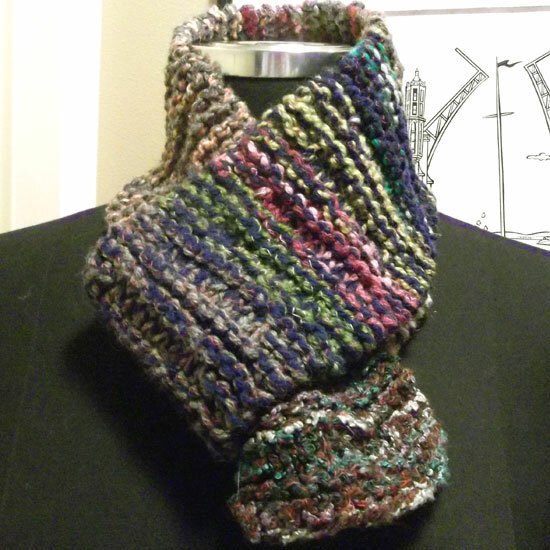 This scarf can be knit in a solid, striped, or multi colored yarn. The pattern shows up best with yarns that have some stitch definition. Click here to get the PDF pattern for Blocky. Pattern is 1 page with full color pictures, please feel free to share with your friends, use in your shop, etc. You make direct people to this page (http://blog.midnightskyfibers.com/2011/01/new-free-pattern-blocky.html) or share the pattern with them directly printed out or as a PDF. When sharing with others please keep the pattern with the copyright and notice intact. Like this pattern? Thanks for sharing it! If you like the pattern it would be awesome if you would take a minute to share it with your friends on twitter and facebook! Need short links? http://tinyurl.com/freeknitpatternblocky and http://tinyurl.com/freeblocky link directly to the pattern. http://tinyurl.com/knitscarf is another short link to this blog post. If you like this pattern you might also like: Circle Vest Knitting Pattern (my most popular pattern for sale to date!) and the Space Hats Pattern Collection. 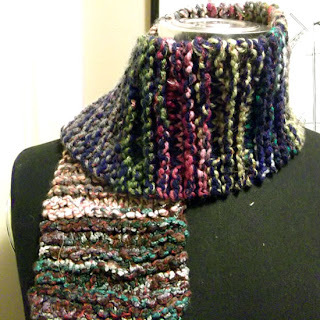 What yarn did you use for this scarf, it is beautiful for a beginner project! I believe this was a mix of different yarns held together!